1951-1958 Chrysler Firepower, Oil Filter adapter. Fits both Hemi and Poly motors. Adapter comes blasted with the fin tops grained for a brite finish. Adapter comes with stainless hardware. Adapter is threaded 1/2" NTP for maximum oil flow. You can replace that old leaky canister with a late model spin on filter. You can hide that filter out of sight or plum this into that BeeHive filter for a truly vintage look!!!!!! 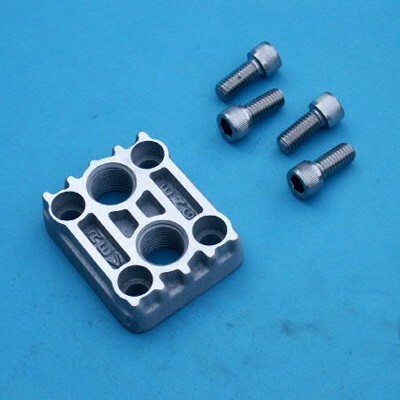 You dont have to settle for a tacky billet adapter on that vintage Hot Rod.